WILD ABOUT HARRY: Was Houdini a chauvinist? 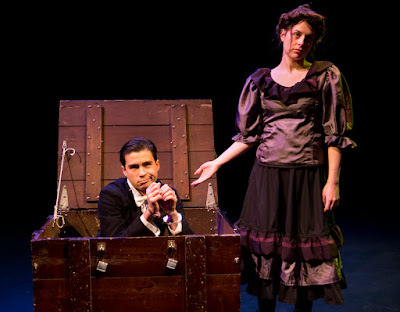 In the new play, Minerva–Queen of the Handcuffs, Houdini, played by Richard Lee Hsi (right), is portrayed as the villain; representative of the chauvinistic attitudes toward women at the time. Playwright Ron Pearson says: "It gave me an opportunity to cast him as the symbol for all of the barriers and inequality that women had to endure at the turn of the twentieth century, particularly female performers." 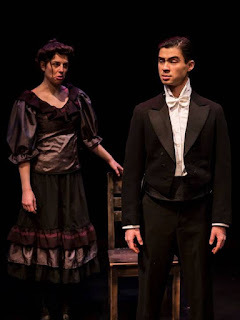 The play has received positive reviews, and I think Minerva is an inspired choice of subject and a great symbol for the ongoing struggle for women's equality in all fields. But is it fair to characterize the real Houdini as an impediment in this struggle? Houdini was a man of his time and I think we can assume he possessed a certain level of male chauvinism that was endemic in society. And there was the crack he made at the male only Circumnavigators Club that he gave up aviation "when women took it up." So he's not without fault. But Houdini also worked alongside women his entire career. Vaudeville had as many female performers as male. And remember that Bess was an equal part of the act for many years. In fact, it was Bess who suggested they change the name from "The Houdinis" to just "Houdini" because she felt they'd do better. And far from being aghast at the idea of a female escape artist, in reality, Houdini backed his own, Miss Trixy (Wanda Timm). Of course, this was done to undermine another female escapist, Miss Undina, who was doing an imitation of his Water Torture Cell. But women in magic did not surprise or offend him. In fact, he revered the reigning female magician of the day, Adelaide Herrmann. 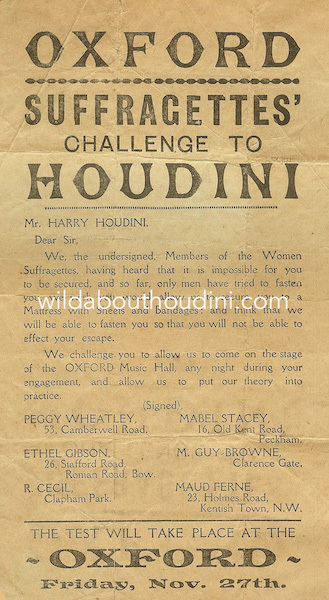 Finally, I'm always drawn to Houdini accepting a challenge from Suffragettes in England in 1908 (the playbill to the right is from my own collection). Make no mistake, this was a political statement at this time. There were street battles with police and bombings in the name of women's suffrage (the right to vote). Many characterized the Suffragettes as dangerous radicals. 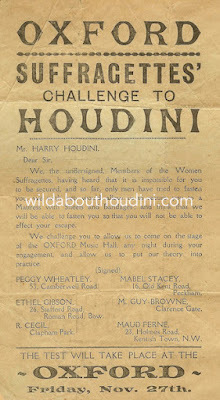 Houdini accepting their challenge, advertising them, and bringing them on stage, along with a committee of 30 women, was showing a measure of solidarity. He was presenting them as equals to the police, military officers, or tradesmen who normally stepped onto his stage to challenge him. It's maybe telling that Variety warned, "This portion of the show would not be enjoyed by a New York audience." Now, I think it fine for playwrights to employ dramatic license and use Houdini in whatever symbolic way they want. Houdini has even been portrayed as a serial killer! But we're in an era when people take their facts from fiction, and we've seen how fictions can catch fire. So I think it's worth pointing out that the real Houdini was no enemy or barrier to women. And in the cases of Jenie Jacobs and the Suffragettes, it could be said he was an aid to their empowerment. As for his hostility toward Minerva... Hey, he was treating her just as he did the many male escape artists that infringed on his act. An equal offender. Minerva–Queen of the Handcuffs is now playing at Theatre Network in Edmonton, Canada, through January 27. For more information and to buy tickets visit the Theatre Network website. Photos by Marc J. Chalifoux. Great article! Minerva-Queen of the Handcuffs uses Houdini as a symbol of the challenges women had to overcome in a male dominated world, then and now. But it's very interesting to hear a positive side to the man in real life when it comes to this issue. Thanks! Sorry! It's Ron Pearson, the playwright, who posted this! Thank you so much for the comment, Ron. And congrats on the success of the play. I hope it travels to LA. I'd love to see it! We have woodcuts with Houdini and Bess from their early years on display. We point out the fact that he call the act The Houdini's giving her full credit. If he has three pictures of himself he has an equal number of pictures of Bess. This holds true for all of the various ads and wood cut from those early years.